Biographical information on each is included below; this information also is available at tx.ag/DA2018. Photos available upon request or at tx.ag/DA2018 and photos.aggienetwork.com/Distinguished-Alumni. The recipients learned of their honor when surprised in their places of business and other locations by university and Association representatives. Association President and CEO Porter S. Garner III, Class of ’79, accompanied by a Ross Volunteer, was present at each of the surprise announcements. 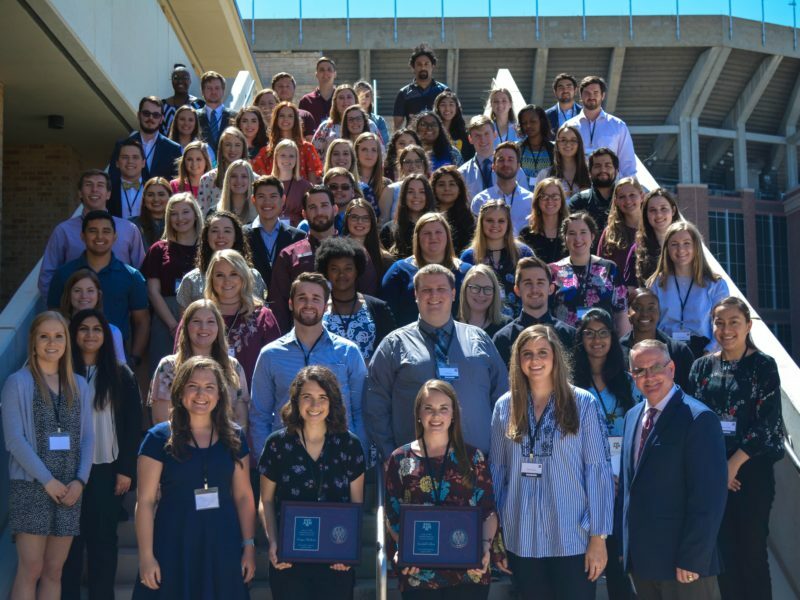 Young, The Association of Former Students’ 2018 Chair of the Board of Directors Jimmy Williams, Class of ’83, Ph.D., Texas A&M Foundation President Tyson Voelkel, Class of ’96, and university mascot Reveille IX and her handler also made several of the trips to congratulate recipients. L.D. “Duke” Hobbs, Class of ’47, was a 314th Infantry sergeant in World War II, earning the Bronze Star and Purple Heart. After returning to Texas A&M to finish his degree, he served as an Air Force intelligence officer in the Korean War. He worked for Procter & Gamble Co., then W.L. Gordon Co. merchandise brokers, where as vice president he was responsible for growing one of the largest non-food organizations in the industry. Upon retiring, he came back to Texas A&M to teach management and direct the Center for Executive Development. He served for more than 20 years as a Class Agent for the Class of ’47 and has been a Fish Camp namesake. Proceeds from his book “I Knew I Was an Aggie When” support Texas A&M’s Cushing Memorial Library. He has been congregation vice president at Our Savior Lutheran Church in College Station; an Eagle Scout, Scoutmaster, merit badge counselor and Boy Scouts of America regional director; a Republican National Convention delegate, election judge and county chair for regional development. Charles L. Pence, Class of ’51, served in Korea and Japan in the Army, then began a 27-year career at ExxonMobil, becoming senior vice president of Exxon’s Friendswood Development Co. and developing the Houston area’s first master-planned community, Clear Lake City. As president of Battlement Mesa Inc., he managed the construction of a new town, Battlement Mesa, near Grand Junction, Colo., to house employees of Exxon’s mining operation. Upon retiring from Exxon in 1982, he co-founded Jefferson Development Co., serving as CEO for 12 years; was co-founder and chairman of Entouch Systems for five years; chairman of SiEnergy LLC for 10 years; and is co-founder and chairman of Si Environmental LLC. He has long supported Corps of Cadets scholarships, and his service to his communities includes chairing the transportation committee of the Houston Chamber of Commerce; serving as co-founder and president of the state’s nonprofit Grand Parkway Association that developed an outer loop around Houston; and helping start University Baptist Church in Clear Lake City and Grace Fellowship Church in Lampasas. A. Dwain Mayfield, Class of ’59, was a lead design engineer of the F-16 fighter jet at General Dynamics Corp., now Lockheed Martin, became Lockheed’s vice president of program development and retired as vice president of marketing initiatives after 44 years in the aerospace industry. Throughout his career, he remained active with Texas A&M, serving on many boards and advisory councils. Mayfield has been Chair of the Board for The Association of Former Students and is a friend and supporter of the students in its Aggie Network Student Ambassadors group. He has served as a member of the President’s Advisory Council, College of Engineering Advisory Council and Chancellor’s Century Council. He and wife Lynda are longtime ranchers in Dublin. They also support Tarleton State University, where Mayfield was named a Distinguished Alumnus in 2017; he is an adviser to the aeronautical team, serves on the Tarleton Foundation’s board of directors and was presented with an honorary doctorate in 2017 for his support and his work with students. Jim Singleton, Class of ’66, has practiced architecture for over 40 years, specializing in educational facilities for over 100 districts in Texas with more than 300 K-12 projects; his work also includes medical buildings, banks, office buildings, athletic centers and pro bono work including the Brazos Valley African American Museum and Bryan’s Queen Theater. Singleton, a Distinguished Military Graduate of Texas A&M, was a U.S. Army scout helicopter pilot in Vietnam. He has been inducted into the Texas A&M Lettermen’s Association Hall of Honor for his leadership in completing the original Texas A&M Sports Museum. In 2012, he was named an Outstanding Alumnus of A&M’s College of Architecture. In 2015, he was elevated to the College of Fellows of the American Institute of Architects. He has mentored dozens of aspiring Aggie architects and in 2016 established the James M. Singleton IV ’66 FAIA Educational Architecture Professorship at Texas A&M. He has served on boards for the Brazos Valley Veterans Memorial, Boys & Girls Club of the Brazos Valley and Brazos Valley Symphony Society. Eddie Joe Davis, Class of ’67, served as president of the Texas A&M Foundation for 23 years, from 1993 to 2016, leading three major fundraising campaigns that brought more than $2 billion in support to Texas A&M. He also served as Texas A&M University’s interim president from 2006 to 2008, following Bob Gates’ appointment as U.S. Secretary of Defense. Davis was a U.S. Army paratrooper in Vietnam, and before joining the Foundation, held every key financial position, including CFO, at Texas A&M and The Texas A&M University System, finally serving as executive deputy chancellor of the System. In 2012, he received the National Commonfund Institutionally Related Foundation Award from the Council for Advancement and Support of Education. His service to others also includes being on the Bryan-College Station Chamber of Commerce board, vice chair of the College Station Development Foundation, a member of the Governance Committee of the CHI St. Joseph Hospital System and many others. He and his wife co-chair the $20 million campaign to build a new church for St. Mary’s Catholic Center in College Station. John S. Sharp, Class of ’72, served Texas for more than three decades in public office before being appointed chancellor of The Texas A&M University System in 2011. As chancellor, he leads one of the largest systems of higher education in the nation, a statewide network of 11 universities and seven state agencies, with a budget of $4.7 billion. Prior to becoming chancellor, Sharp represented Victoria in the state House of Representatives from 1979 to 1983; served as a state senator from 1983 to 1987; was Texas’ railroad commissioner from 1987 to 1991, then was state comptroller from 1991 to 1999. After working as a principal at tax-consulting firm Ryan LLC, he was appointed head of the state Tax Reform Commission in 2005. In 2017, the State of Texas tapped him to lead the Governor’s Commission to Rebuild Texas post-Hurricane Harvey. Sharp was student body president and a member of the Corps at Texas A&M and served as a second lieutenant in the U.S. Army Reserves. Joe B. Swinbank, Class of ’74, started his first business while still a Texas A&M student, and today is co-founder and co-owner of Sprint Companies in the construction waste and industrial service sectors. He has been a leader and catalyst throughout the formative and ongoing stages of Texas A&M’s Rural Entrepreneurship Program in the College of Agriculture & Life Sciences, including mentoring, serving as a “Prof for a Day,” participating yearly in an entrepreneurial symposium and supporting a seminar series and a graduate teaching assistantship and new classroom. In 2014, he led the establishment of a fund for the M. Edward Rister ’74 Chair in Rural Entrepreneurship. He has served as a member of The Gardens at Texas A&M committee and the College of Agriculture & Life Sciences development council. He has also supported Texas State Technical College and served as a speaker to local high schools educating students about industrial job opportunities. In Fort Bend County, he has served on boards for the Work Force Commission, Habitat for Humanity, and Economic Development Board. Robert Earl Keen, Class of ’78, is an award-winning singer/songwriter with 19 albums to his credit. His most recognizable song is “The Road Goes On Forever.” He came up through the Texas folk scene to receive recognition as an Americana music pioneer, credited with bringing a new heyday to grassroots Texas music. In 2012, he was inducted into the Texas Heritage Songwriters Hall of Fame; in 2015, he received BMI’s Troubadour Award for songwriting. He has raised, through more than a decade of benefit concerts, three-quarters of a million dollars for The Hill Country Youth Orchestras; he has returned to Texas A&M to play benefits for those affected by Hurricane Harvey and the 1999 Bonfire collapse; and he has worked to support groups including the Make-A-Wish Foundation, St. Jude Children’s Research Hospital, Kerrville’s Peterson Regional Medical Center, United Way-Hays County, The Fisher House at Fort Sam Houston and many educational causes. He created the “What Does Music Look Like To Me?” art contest program in Kerrville schools. Unique within the music industry, he provides his musicians and bandmates security by keeping them on salary year-round with insurance and retirement accounts. Kathleen Miller Gibson, Class of ’81, is president and CEO of Southwestern Medical Foundation. In 25 years at Bank of America, she held leadership roles in corporate banking, international banking, asset management, risk and commercial banking, and was president of Bank of America-Dallas; moving next to Citibank, she became president of Citibank Central US Commercial and Citibank Texas. She was named to Profiles in Diversity’s “10th Annual Women Worth Watching” and was one of the Dallas Business Journal’s “Top 25 Industry Leader in Women in Business.” She has been Chair of the Board for The Association of Former Students and a trustee of the Texas A&M Foundation, the 2018 campus Muster speaker and a Fish Camp namesake. Awards have included Texas A&M’s agricultural economics Tyrus R. Timm Honor Registry and the Women’s Legacy Award. She serves on the advisory board of Texas A&M’s Bush School of Government and Public Service and previously served on boards including the Dallas Regional Chamber, Children’s Medical Center, Lamplighter School and the Dallas 2012 Olympic Bid Committee. Graham Weston, Class of ’86, co-founded cloud computing firm Rackspace Hosting and has served as its CEO and Chairman of its Board. A business entrepreneur since he was a seventh grader, he creates ventures that help San Antonio entrepreneurs, and his Weston Urban development firm is partnering with the city to revitalize the west downtown area. His past real estate development has included San Antonio’s Weston Centre. He co-founded Geekdom, a collaborative co-working space for San Antonio startups, and his 80/20 Foundation invests in nonprofits that improve San Antonio’s tech entrepreneur ecosystem. In 2005, he was honored by the city for converting one of his vacant properties into a temporary shelter for more than 2,500 victims of hurricanes Katrina and Rita. At Texas A&M, he supports agricultural economics and entrepreneurship programs, making many personal visits to classes; he has also invested in increasing cloud computing education in San Antonio. Media contact: Kathryn Greenwade, 979-845-7514, KGreenwade88@AggieNetwork.com.